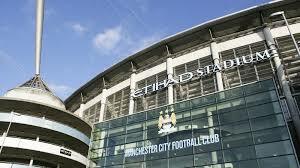 MANCHESTER CITY STADIUM | MY LIFE AND LIVING WITH AUTISM. 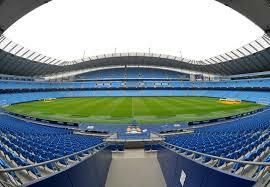 Today i have been to the Manchester City Football teams stadium (or Etihad Stadium). I went because i thought i was doing some work experience there. I went with one of my support workers called Steve, who is a massive Manchester city fan, and a few other people. When we got there we had to wait in the reception area for someone called Paul (same name as me). When i asked why this was, Steve said it was because Paul had to show us around first before any work was undertaken. It was basically an induction, like the one at a gym. When i say work, i mean small menial tasks like giving the seats in the stadium a quick wash over. When Paul arrived he began to show us around the place. He told us that it was a work place so no one could mess about. They went into this room where there was a TV showing sky-sports news. There was a few people sitting down and also having a drink. They was probably on their break. We all sat around a table because i think one of the people from my college had to sign a few papers. Steve knew i didn’t like sitting around the table with all these people, so he asked me should we wait outside the room until they had finished. I obviously said yes. As we was waiting outside the room and chatting, a person went into the room where we had been in a few minutes before. After a short while he came out and was pushing a large trolley. And on it was a large dark brown box. Steve knowing a lot about the stadium told me that inside the box that was just wheeled out was the premier league trophy. I was glad to be this close although i didnt see it. Shortly after, the rest of the people came out of the room. We walked out of some doors and we was in the tunnels. The tunnels where the footballers walk out onto the pitch to thousands of cheering fans. It was fantastic. We saw where the players was interviewed after the match and continued up the tunnels onto the edge of the pitch. It was a big stadium but it was smaller than i expected. I asked Steve (when we was going out of the pitch) how many seats there was in it, and he said 48,000. At the edge of the pitch i saw just how pristine the grass was. Absolutely immaculate piece of ground. I would have loved to have gone on it, but there was a big fine if you did step on it. I saw the managers seat, where he would sit watching his army of footballers try to win the game. There must have been hundreds of emotions going on in that seat when he was there. On the right side of the pitch there was massive cranes towering over us. That was because the stadium was getting more seats. Steve mentioned it would have about 65 thousand all in all i think. After 10 minutes it was time to leave because my Taxi driver Javid would be waiting. I would be doing work next time i go there. About an hour ago, on the news it said Princess Anne was at the exact same stadium i had been too. And then i vaguely remembered Paul said something about that when i was there, but i was too anxious to think correctly at the time. And she was there at the same time. I bet we nearly bumped into her. That would have been a great story to tell. Imagine when i was stood at the edge of the pitch, a royal came and stood next to us. That would have been nerve racking and amazing. Even though i don’t support the club it was a great experience to have. Glad you got a chance to walk around and get a little bit used to the place before you had to start working. Hope it goes well tomorrow! It would have been a hoot to meet or see the princess! Have a good day tomorrow!